The European Society of Cardiology together with the European Atherosclerosis Society published updated dyslipidaemia guidelines in 2011. 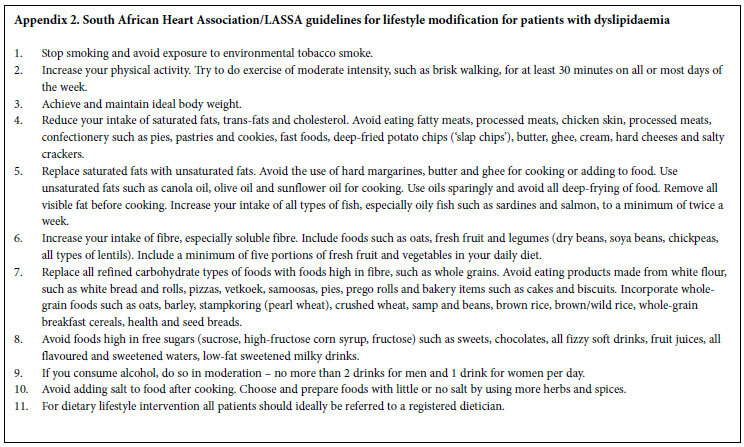 SA Heart and the Lipid and Atherosclerosis Society of Southern Africa officially adopt these guidelines. This statement adapts aspects of the guidelines to the South African situation. Using the updated Framingham risk charts, interventional strategies are based according to the cardiovascular risk score and low-density lipoprotein cholesterol (LDL-C) levels. The Framingham risk score refers to the 10-year risk of any cardiovascular event, and includes four categories of risk. Treatment targets are those of the European guidelines. The LDL-C goal is 1.8 mmol/l for the very high-risk group (>30%), 2.5 mmol/l for the high-risk group (15 - 30%), and 3 mmol/l for those below 15% risk. Intensive management of dyslipidaemia in South Africa will significantly reduce the cardiovascular disease health burden. In 2003, the South African Heart Association (SA Heart) and the Lipid and Atherosclerosis Society of Southern Africa (LASSA) officially adopted the European Guidelines for the Prevention of Cardiovascular Disease1 to replace the South African Lipid Guidelines published in 2000.2 The European document has recently been updated with the publication of the European Society of Cardiology (ESC)/European Society of Atherosclerosis (EAS) Guideline for the Management of Dyslipidaemias in 2011.3 This Consensus Statement promotes current best management of dyslipidaemia and should be adopted by all health care professionals in South Africa. 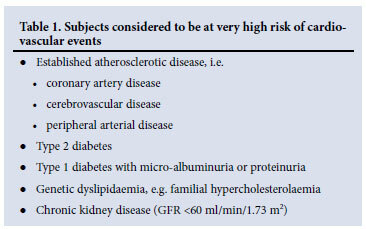 Individuals who are considered to be at very high risk of cardiovascular events are listed in Table 1. Patients in this group DO NOT require cardiovascular risk scoring, because the risk score will be an underestimate in these settings.  auto-immune chronic inflammatory disease, e.g. rheumatoid arthritis, systemic lupus erythematosus, psoriasis. In South Africa, because the prevalence of familial hypercholesterolaemia is as high as 1 in 100 in some communities, each individual should be tested, preferably with a full lipogram or at least TC/LDL-C, at least once in young adulthood (from 20 years of age). Particular attention should be paid to individuals with other risk factors for CVD. The updated Framingham CVD risk tables for men and women and an algorithm for management and cholesterol goals have been incorporated into these recommendations (Appendix 1). LDL-C is preferred when deciding on treatment and assessing its effect. LDL-C is used in preference to other tests as it is modifiable by treatment and the beneficial effects of lowering LDL-C are known. LDL-C may be measured directly or calculated from the Friedewald equation (in mmol/l) (LDL-C = TC - HDL-C - TG/2.2), provided the triglycerides do not exceed 4.5 mmol/l. Once the relationship between on-treatment TC and LDL-C is known, it may be appropriate to monitor TC only. TC may be used as an alternative for screening, risk assessment and monitoring of treatment efficacy if there are cost constraints or if there is difficulty in obtaining either direct or indirect LDL-C values.  TC = 4.0 mmol/l is approximately equivalent to LDL-C = 1.8 mmol/l. If TC values remain uncontrolled and LDL-C measurement is unavailable, the patient should be referred to a specialist physician. A full lipogram (TC, HDL-C, LDL-C and triglycerides) is recommended for initial diagnosis of dyslipidaemia. In patients with pure hypercholesterolaemia, LDL-C alone is adequate for follow-up, but a full lipogram is recommended where increased LDL-C is not the only abnormality in the lipid profile. After initiating TLC alone, follow-up testing should be performed every 6 months. After initiating pharmacotherapy, changing the dose or changing the specific drug prescribed, testing should be repeated at 8 (±4) weeks and thereafter, once the patient is at goal, every 6 months. Various point-of-care tests are available. They provide various results, ranging from TC alone to a full lipogram. Where finger prick testing is performed, the facility should ensure that adequate quality controls are in place, that the test strips and devices are stored under appropriate conditions of temperature, humidity and light, and that precautions are taken to perform the test properly, with an adequate blood sample volume and without contamination.10 The finger should not be squeezed or 'milked', as this will give inaccurate results. Finger prick testing is appropriate for screening and follow-up to determine where advice on lifestyle intervention is required (e.g. TC >5 mmol/l), but is not appropriate to commit a patient to a lifetime of therapy. Where a screening finger prick TC measurement is high (>5 mmol/l), the patient should be encouraged to discuss their finger prick screening result with their doctor, who should have a full laboratory-performed fasting lipogram done and then perform a full cardiovascular risk assessment. Because inappropriately low results are a concern, TC <2.5 mmol/l on a finger prick test should be confirmed. Finger prick testing that measures TC alone will not detect raised triglycerides. The use of novel biomarkers of CVD (e.g. hsCRP) and imaging technologies (e.g. coronary calcium scoring, carotid intima-media thickness) is not recommended routinely and should be reserved to refine risk assessment in patients considered to be at moderate risk where there is uncertainty about whether to initiate drug therapy.8 It should be noted that hsCRP is a nonspecific inflammatory marker that may be elevated from many causes (e.g. acute infections or non-infectious inflammatory disorders). Measuring Lp(a) is only appropriate in HIGH CVD risk subjects and/or when there is a family history of premature CVD. When Lp(a) is used as a risk marker, the cut-off value is >50 mg/dl. Dyslipidaemia may occur in response to another condition or treatment. Table 2 lists those encountered most commonly. The appropriate diagnostic tests should be performed when secondary dyslipidaemia is suspected and the underlying abnormality treated. The risk levels determined for the SCORE system refer to the 10-year risk of a fatal CVD event, whereas the Framingham scoring system refers to the 10-year risk of any CVD event. Risk thresholds for the Framingham score are therefore approximately 3 times those for SCORE. Table 3 sets out the recommended appropriate intervention strategies according to the percentage risk calculated from the Framingham risk score and the LDL-C value obtained. Although we recommend the use of the Framingham risk charts to estimate cardiovascular risk, the management of patients, once risk has been determined, and the goals of therapy, are those of the European guidelines. 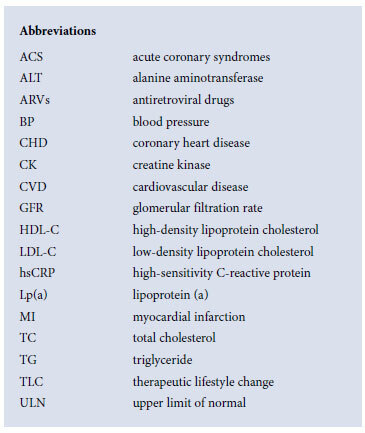 LDL-C goals for patients at different levels of Framingham risk are listed in Table 4. Because the total cardiovascular risk is the product of a number of risk factors, the treatment of dyslipidaemia must always be seen within the broader framework of cardiovascular disease prevention. It should be emphasised that the cornerstone of any programme to reduce cardiovascular risk is TLC (healthy diet, regular exercise). In order for the changes to be sustainable, dietary and exercise advice must be practical and tailored specifically to the individual's personal and cultural preferences.11 Diets may need to be modified for people with unusual or specific disorders (e.g. hypertriglyceridaemia) and referral to a dietician and fitness professional is encouraged. 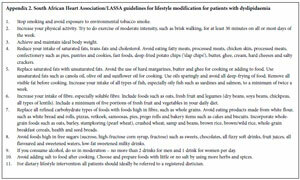 An example of lifestyle and dietary advice that is relevant to the South African population is listed in Appendix 2. Epidemiological and interventional studies support the role of healthy dietary choices as a whole to help reduce the risk of cardiovascular events. However, insufficient evidence exists to recommend the use of dietary supplements in patients with dyslipidaemia. While some dietary supplements have been shown to influence plasma lipids, there are no outcomes data that show benefits with regard to CVD prevention. Conversely, there is evidence that some supplements may be harmful to health and may interact with prescription medicines.12,13 Consumers should be advised to beware of unsubstantiated advertising claims relating to long-term health benefits. Statins have demonstrated effectiveness in both primary and secondary prevention. The effect is dependent on the extent to which LDL-C is lowered and not on the type of statin used. At their maximum doses, the various statins differ in their capacity to lower LDL-C.
 17% reduction in stroke. The effect of statin therapy is similar in all patient subgroups and becomes significant after 1 year, increasing progressively thereafter.  The use of 80 mg simvastatin should be restricted to those who have been using the dose chronically (longer than 12 months), without signs or symptoms of myopathy.  Patients who are using simvastatin 80 mg and who need to start taking another drug that may interact with simvastatin should be switched to an alternative statin with a lower risk of drug interactions, such as rosuvastatin or atorvastatin.  Patients who do not reach their LDL-C goal with 40 mg simvastatin should be switched to an appropriate alternative more potent statin with a lower potential for myopathy.  simvastatin is contraindicated with azole antifungals, macrolide antibiotics, HIV protease inhibitors, gemfibrozil, cyclosporine and danazol. When used in appropriate patients, statins are remarkably safe drugs and the benefits of cardiovascular protection far outweigh the potential for toxicity. However, patients should be encouraged to make and sustain healthy lifestyle choices and the lowest dose of statin to achieve LDL-C target should be used. The presence of any musculoskeletal pain should be documented before starting statin therapy to facilitate the recognition of statininduced myalgia during treatment. A CK measurement prior to commencing statin treatment is recommended. Statins should not be started if the CK is >5 times the ULN. Routine CK monitoring is not necessary during treatment, unless the patient develops myalgia. Increased vigilance regarding CK and myopathy is necessary in the elderly, in those on concomitant interfering treatment or on multiple medications, and in the presence of liver or renal disease. as atorvastatin or rosuvastatin, may be used on alternate days (e.g. Monday, Wednesday, Friday) or even less frequently to reduce sideeffects.17 Alternatively, a combination therapy of a low-dose statin with a lipid-lowering drug of another class (e.g. ezetimibe) can be considered. Baseline ALT measurement should be performed before initiating treatment with a statin. If the ALT is normal, it does not need to be repeated. Raised ALT does not exclude statin therapy, where treatment should be individualised. Alternative reasons for raised ALT (e.g. haemochromatosis, fatty liver) should be investigated where necessary. If the ALT is raised <3 times the ULN while on treatment, continue the statin and recheck ALT in 4 - 6 weeks. If the ALT is raised >3 times the ULN on treatment, stop the statin and repeat ALT in 4 - 6 weeks. Cautious reintroduction of the statin can be considered once the ALT has returned to normal.  First evaluate the risk.  Involve the patient in CV risk management decisions.  Identify the appropriate LDL-C target.  Calculate % reduction in LDL-C required to reach target. 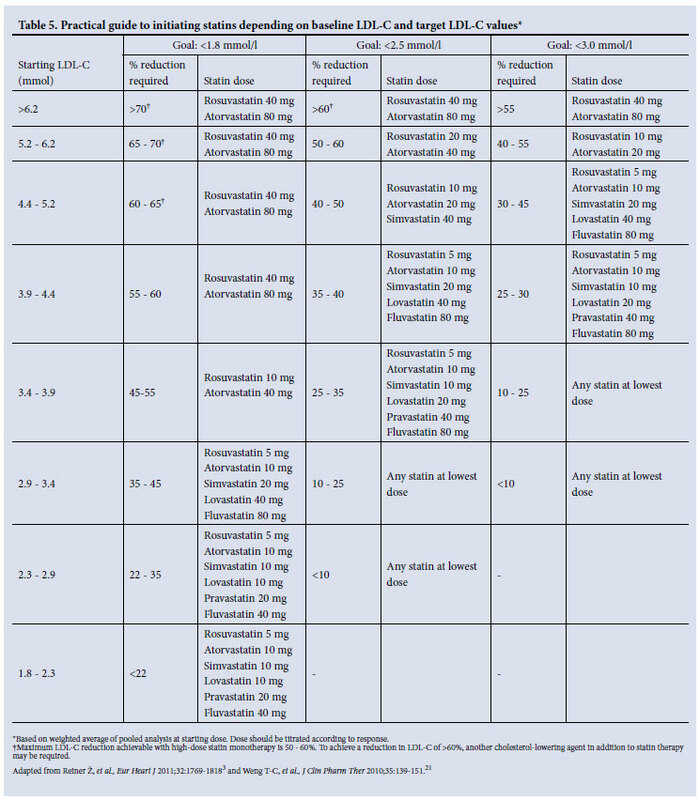  Choose the statin (and dose) able to achieve the desired reduction (Table 5).  It is mandatory to up-titrate the dose to achieve the LDL-C target.  If target is not reached at maximal dose, consider a more potent statin or add a lipid-lowering drug from another class.  The final statin choice will be influenced by concomitant conditions, concomitant drug therapy and tolerability.  when there is a contraindication to a statin. Bile acid sequestrants and nicotinic acid have cholesterollowering properties. They may occasionally be useful alone or in combination with statin therapy. However, their side-effects limit wider application. Whereas low levels of HDL-C and high levels of TG are undoubtedly associated with a higher cardiovascular disease risk, no currently available treatment directed at reversing these changes has been shown to significantly benefit cardiovascular outcome. A high triglyceride level, particularly if >10 mmol/l, can result in acute pancreatitis and should be treated without delay. A lipid profile should be obtained at the time of admission in patients presenting with ACS. They should be treated with high-dose statin therapy during their acute care and the statin dose should be adjusted at the time of discharge according to the admission lipid profile. 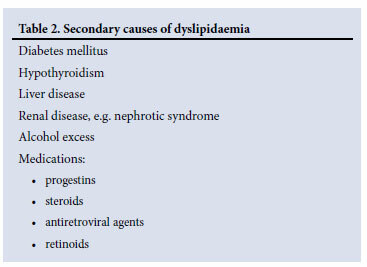 Dyslipidaemia frequently accompanies HIV and may be aggravated by ARVs. While there is limited information, particularly in South Africa, it is important to measure lipids in patients with HIV and estimate their CVD risk, and a full lipogram should be performed before initiating ARV treatment. The Framingham tables will generally underestimate CVD risk in this population. In patients with high lipid levels already on ARV treatment, switching to an alternative ARV and cautious use of a statin or fibrate as necessary should be considered. Simvastatin is contraindicated in patients using protease inhibitors. Unexplained cutaneous or tendinous deposits (xanthomata), very premature vascular disease, some endocrine, metabolic and neurological disorders constitute reasons for referral. Unusually low TC (<2.5 mmol/l), LDL-C (<1.5 mmol/l), HDL-C (<0.7 mmol/l) or unusually high TG (>10mmol/l), TC (>15 mmol/l), LDL-C (>12 mmol/l), HDL-C (>2.5 mmol/l) also deserve special consideration. In order to implement the guidelines, we propose a simple chart that has been updated to accommodate the new Framingham CVD risk tables (Appendix 1). The chart is a guide to management only and should not replace an individualised assessment and treatment plan based on the clinical judgement of the doctor. We encourage the reader to read the 2011 European guidelines in full, which may be accessed on the ESC website www.escardio.org/guidelines. We hope that dissemination of these guidelines will go some way towards helping to reduce the burden of CVD in South Africa. In October 2011 a broad-based group of participants from the medical and allied health community, medical funders, pharmaceutical companies, the Department of Health, the Board of Health Funders and the Heart and Stroke Foundation met together with Professor Marja-Riitta Taskinen in Sandton, Johannesburg, to examine and discuss the joint ESC/EAS dyslipidaemia guidelines. Professor Taskinen is a co-author and Task Force Member of these guidelines and attended on behalf of the European Atherosclerosis Society. The following day a writing committee met to construct the South African Consensus Document. Additional delegates attending the Dyslipidaemia Guidelines Meeting Discussion Group were Dr A Amod (SEMDSA), Ms G Bartlett (Universal Health), Ms U Behrtel, Dr S Bhana (Netactive), Ms M Campbell (Discovery), Mr D Craythorne (Cipla), Mr A Dansay (PharmaDynamics), Ms L Doms (Medscheme), Ms A du Plessis (Vital Health), Ms U du Preez (Astra Zeneca), Dr R Espaillat (Abbott Laboratories), Dr Craige Golding (Solal Laboratories), Ms K Jamaloodien (National Department of Health), Dr D Katzman (MSD), Dr S Kahn, Mr M Lambert (Aspen), Dr M Makotoko, Mr M Mashego (Adcock Ingram), Ms Y Misra (MediKredit), Dr M Mpe, Dr V Mungai-Singh (Heart and Stroke Foundation), Ms L Naidoo (Sanlam Healthcare), Ms N Nel, Dr R Patel (Board of Healthcare Funders), Ms D Pithey (MSD), Mr J Rall (Ranbaxy), Dr J Snyman (Agility Global Health Solutions), Dr M Sussman (SA Heart), Dr M Swanepoel (Medihelp), Professor J P van Niekerk (South African Medical Journal), Ms L Xiphu (QUALSA/Metropolitan).